“The waters thereof roar and be troubled” (Psa 46:3). We may wonder why some people always shout, get angry and are always in a rage. From the above verse we find that roaring people are troubled people. When your heart is troubled, you unnecessarily shout and get upset over very little things. “The wicked are like the troubled sea, when it cannot rest, whose waters cast up mire and dirt. There is no peace, saith my God, to the wicked.” (Isa 57:20,21) So when your heart is restless like a troubled sea and there is no peace in your heart, you will be not only shouting but also casting up mire and dirt on others. In other words, a troubled man will always blame others for everything that is happening around him. Child of God, do you blame others for your problems? Then the reason is, your heart is not resting in Jesus. 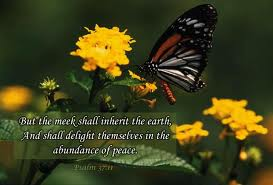 “The meek shall inherit the earth; and shall delight themselves in the abundance of peace” (Psa 37:11). A meek person will be peaceful and at rest no matter what problem or trial he faces. How do you face the trials and troubles in life? Do you often accuse others for the problems you face? Do you get troubled about little things? It is a true saying that the heart of the problem is the problem of the heart. When our heart is right with God everything will fit in the right place like a jigsaw puzzle.